A health board partnership is Grŵp Cynefin’s most ambitious yet as it moves to develop truly sustainable communities, says Shan Lloyd Williams. Evolution of the offering from social housing providers is accelerating faster than ever, as we all respond to the challenging financial climate, not to mention the more complex needs now apparent among the communities we work with. It’s no longer just about affordable housing. Sustainable communities are now the objective. At Grŵp Cynefin ‘more than housing’ has been our mission for many years already, and we are proud to be at the forefront of innovation, as we achieve our goal. Our newly-published Growth Strategy 2018-21 outlines a particular initiative that is truly transformative. It will be a multi-million pound scheme with the aim to develop a health, social care, housing, and community campus with a difference. It’ll incorporate features such as residential care, while the scheme overall is devised properly to tie in with the locality’s regeneration needs. Devised to improve the overall health and well-being of its particular community, it’ll be built in Penygroes, for people living there and in the surrounding Nantlle Valley, Gwynedd. The idea came about through conversations between Grŵp Cynefin and Betsi Cadwaladr University Health Board, and we’re now working together to deliver this ground-breaking provision. It’s still early stages, but as chair of the project delivery board, I’m pleased that a feasibility study reports enthusiastic support from both the local community and stakeholders who welcome such an ambitious project. We are currently in the process of developing a robust business case for capital and revenue funding. Gwynedd Council is also a key partner, and we’ve got support from all the other statutory, third sector, and community interests we’ve approached to join us. Some people ask me what’s in it for Grŵp Cynefin to lead on such a development. Well, it fits our vision to help improve the health and well-being of the people living in the communities where we provide housing. It links in very strongly with our values around regeneration and creating sustainable communities, including support for the Welsh language and culture. 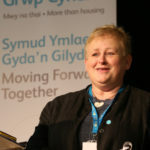 The concept of what the campus may look like will develop in the forthcoming months, and may bring together two currently single-handed GP practices, a pharmacy, Grŵp Cynefin offices, a residential care home, and other provision such as social care services, at a single site, that incorporates the need to recognise and respond to Welsh language and culture. But this is just one project in Grŵp Cynefin’s ambitious five-year growth strategy. In it, we also outline our plan to build 400 additional new homes by 2021. They’ll comprise 360 new social housing units, plus 48 new homes for intermediate rent, under the Welsh Housing Partnership. Our strategy also includes taking greater measured risk; plans to seize opportunities presented by the Wylfa Newydd project, and partnerships and collaborative working with other RSLs. A further objective is to improve our performance, by being creative and open-minded in achieving better value for money for our tenants and customers. Innovation will for us continue to be key to successful delivery, as we prepare for the likelihood that the current tough financial environment becomes the norm. New ideas and different ways of working are essential to help meet the needs of a population that is increasing and ageing. Fortunately, we’re starting from a position of strength, as we’ve already secured all the financing capacity for our development plans for the next two to three years. Going forward, we’re also going to make greater use of market analysis, feedback from tenants and customers, and intelligence from local authorities and health boards. We’re also going to provide more homes via shared ownership, Homebuy, and via market and discounted sales. Last but not least, we’re going to invest significantly in our hard-working staff. They are our ambassadors and our most important asset. We’re investing more into employee development and training, with the aim of achieving a 95 per cent level of staff satisfaction by Year 3. We are already respected by local authorities in particular, for our ability to be flexible in our approaches and to develop innovative solutions that best fit the problem or unmet need. This approach is important, and our new growth strategy shows how we’ll carry this approach into the future across all our offerings, as illustrated by our exciting new campus concept.